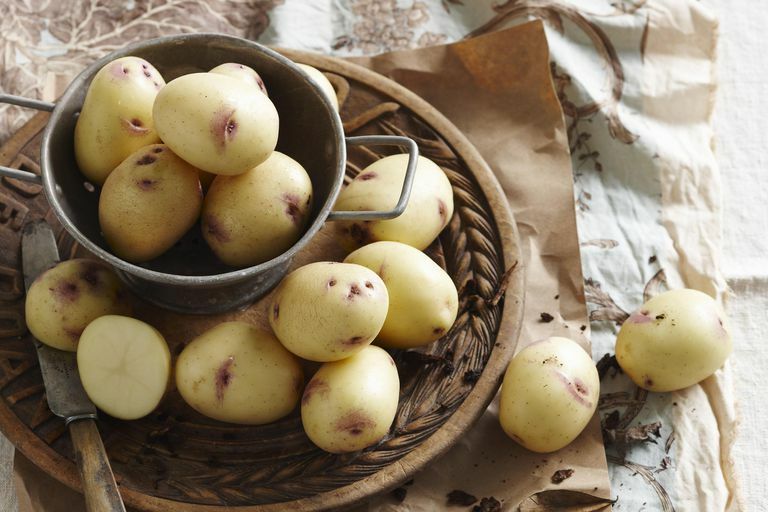 Why Do Potatoes Raise Blood Glucose More Than Sugar? Why Do Potatoes Have a Higher Glycemic Index Than Sugar? Did you know that potatoes have a relatively high glycemic index (GI) score? The GI rates how much certain foods raise your blood glucose. Each variety of potato has a different index score, but many of them fall between 80 and 90. Potatoes are a staple in diets throughout the world because they are an affordable and nutritious vegetable. People who choose to limit high-glucose foods wouldn't obviously avoid potatoes because we often associate high GI foods with those foods that contain sugar. So how is it that potatoes have a high GI score? It's all about the starch and how it converts to glucose in your body. Too often, glucose is associated with sweetness. Regular white potatoes are not a food that is considered sweet. However, potatoes are almost all starch and starch is made up of long strings of glucose. Since the starch in potatoes is rapidly digested, the glycemic index of potatoes can be almost as high as that of glucose alone. The glycemic index of glucose is 100 points. Potatoes are usually listed as being in the high 80s or low 90s. However, potatoes have a higher GI score than table sugar. How is that possible? Sucrose (table sugar) has a GI of 59. It is a disaccharide (two sugar) molecule—it's made up of one glucose molecule and one fructose molecule. Fructose is processed differently in your body than glucose, and it doesn't affect your blood sugar as much. An ounce of carbohydrate from potatoes has twice as much glucose as sugar. When you think of it that way, it's only logical that potatoes would raise blood glucose more significantly than table sugar. However, not all potatoes are created equal and there are ways to lower their impact on your blood glucose. You may still be able to enjoy a few potatoes here and there; just keep your servings in check. The starch in potatoes is converted to sugar in your body. For that reason, potatoes can have a more significant response on blood glucose than table sugar. There are many varieties of potatoes and it would not be accurate to say that every potato has a glycemic index of 80 or 90. In fact, researchers have found that some varieties of potatoes can be as low as 53 on the glycemic index. In one study, researchers put seven potato varieties to the test: Russet Burbank, Mayflower, Nicola, Bintje, Carisma, Desiree, and Virginia Rose. Of these, they found that the Carisma potato had a GI of 53, making it the only one of the group to be classified as low-GI. The Nicola was the next highest at 69 GI, falling into the medium-GI category. Russet Burbank potatoes, which are very popular, ranked the highest at 82 GI. In general, potatoes can range in GI value from 53 to 111, with white potatoes typically showing up lower on the index. Leaving the skin on adds fiber, which can reduce the potato's effect on glucose. Often, the sweet potato is rated with a GI in the mid-40s. The way you prepare your potatoes, including cooking method and added ingredients, can have an impact on the glycemic impact. A study published by the Journal of the American Dietetic Association examined how different cooking methods affect the glucose response of potatoes. Researchers found that the way that potatoes are prepared plays a big role. They advised consumers to precook potatoes and consume them cold or reheated if they want to minimize glycemic impact. Instant mashed potatoes and boiled red potatoes elicited the highest glycemic response. Roasting potatoes and baking potatoes had a slightly lower glycemic response. There has been concern over the accuracy and the effectiveness of using GI for managing blood sugar. One issue is the accuracy of testing procedures. A problem arises in that the tests for the glycemic index only show an average, while the glycemic index number itself is actually an average of those averages. In the case of potatoes, the different studies used to compute the index have results ranging from 53 to 111. Each of those studies was run on a number of people and only the average was reported. So, the glycemic index number itself may not be accurate enough to be helpful. Other researchers have reported that using the glycemic index alone may not provide substantial health benefits. Some studies have shown that the index can be helpful in the management of diabetes, obesity, and cardiovascular disease risk. Other studies have found the opposite. There are different factors that you should consider when deciding whether or not to include potatoes in your low GI diet. Different people have different glycemic responses to different foods. The most significant factor is how your own body reacts to a potato. You can get this information with a blood glucose meter. This information is especially important if your body is on the diabetes spectrum and doesn't process sugars well. High blood sugars take a toll on your body, making damage to your pancreas and other complications from diabetes more likely. Potatoes have many nutritional benefits. A single serving of potatoes is considered to be 150 grams. The glycemic load (and glycemic response) will depend on how much you eat at one time and what other foods you have with the potatoes. Most of the time, potatoes are eaten as part of a meal rather than by themselves and that will modify how they affect your blood glucose. For instance, if you eat low-carb meat with a small potato side and a salad, the meal is balanced. The other foods can actually reduce the effect the potatoes have on your glucose. The same can be said for low glycemic foods like beans and many vegetables. If you cook potatoes into a dish that has plenty of fat, protein, or fiber, the glucose effects are also diminished. While potatoes can be quite high in glucose, keep in mind the things you can do to reduce it. If you want to eat potatoes, select a lower GI potato variety, enjoy smaller servings, and pair potatoes with foods that counteract the glucose. Most importantly, monitor your blood glucose and see how these changes affect you personally. American Diabetes Association. Grains and Starchy Vegetables. 2017. Ek KL, Wang S, Copeland L, Brand-Miller JC. Discovery of Low-Glycaemic Index Potato and Relationship With Starch Digestion in Vitro. British Journal of Nutrition. 2014;111(4):699–705. doi: 10.1017/S0007114513003048. University of Sydney, Australia. Glycemic Index Database. 2017.